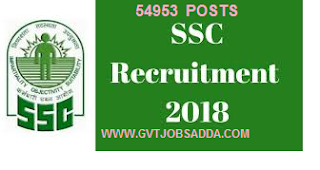 Staff Selection Commission (SSC) Has Recently Published Job Notification For The Post of Constable (GD) 54953 Posts, Expected date of apply online on 21 july 2018. Those candidates who are interested in Armed forces they can read notification carefully and visit ssc official website & apply online before last date. Brief information mention below. How To Apply : Interested & Eligible Candidates should Can Apply Through ssc official websit- https://ssc.nic.in/ from 21 july 2018 to 20 august 2018. For more detailed information about Educational Qualification in (SSC constable GD) For 54953 posts Recruitment candidate can check the Advertisement Notification.